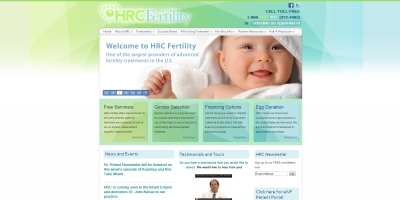 HRC Fertility came to Website Physician medical website design for a new website that allowed the staff at HRC to take full control of their site. They wanted the ability for their internal staff to accomplish daily tasks including updating content, adding new pages, adding news items etc. The result is a robust content management system website that accomplishes the above and more including a new blog and forum for the staff to communicate with customers first hand answering questions about certain medical conditions. The medical website designed by Website Physician also gives user rights to editors allowing them to edit specific sections, categories and pages. This great feature gives each branch office the right to only edit their portion of the website without interfering with another branch location portion of the website. Website Physician provides monthly maintenance for their site including adding new pages, assisting in writing content, social media entries, editing forms etc. Website Physician also provides hosting services as well as search engine optimization for the site. This website is a leader in the medical field in both ease of use as well as search engine optimization. For more information about a medical website content management system in which you and your staff can have full control of with no reoccurring expenses, please contact us at 513-759-4932 or simply fill out our online contact form for a free quote. Click here to view the full HRC Fertility website.